Fireplace refacing stone comes in many choices. There are many reasons you may want to replace the current stone on your fireplace. Remodeling Project - Your fireplace is showing its age. If this focal point of the room looks outdated, it'll become an eyesore in a newly remodeled home. Unable to Clean - Exterior smoke stains can be removed with special products, but you risk having the newly cleaned stone become a different coloration than the rest of the surrounding stone. Home Purchase - You may have purchased the home recently and are in the process of making changes to better reflect your tastes. Refacing a fireplace can help you to make the home yours while giving you the opportunity to modernize the style and overall design. Need a Facelift - You're just tired of the old brick fireplace and want a granite surround. There are many choices for your fireplace facing that weren't available a few years ago. If you're a do-it-yourselfer, you'll be happy to discover many of the available products are just for DIY. You decide to do this project yourself, then check your state's building codes before you do anything to your fireplace.Typically, building codes state: no flammable materials within 6 inches of the firebox and maximum projection of 1/8" per inch from firebox. Once you're clear on what needs to be done, you can tackle this DIY project. Clean the surface you're going to reface. If the surface is painted brick, then you'll need to install backer board or if codes don't allow this sheetrock kind of board, then you can use a metal lathe over the brick securing it with concrete screws. You'll then install the new stone on top of this. Just be aware this layering adds mass and size to the overall appearance of the fireplace. You cannot lay tile directly over a painted brick fireplace because it won't adhere. The back board gives you a new surface to which you can attach the tile. If none of the options appeal to you, then the only solution left is to remove the brick and reface with a different stone. If your brick fireplace isn't painted: You'll need to clean the brick so the bond will hold the new refacing stones. You can use what is known as a cleavage membrane then thinset and install the tiles. If you don't need the weight support of a membrane and your stone is thin enough, you can use thinset adhering it directly to the brick with this kind of mortar. Be sure that your thinset is rated for high-temperature applications. 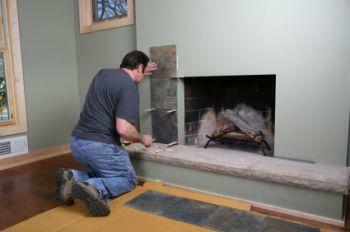 A rock fireplace presents several issues when it comes to refacing. The most common method of refacing is to drywall over the existing rock and then reface with the stone of your choice. Once more, you'll need to be certain your project follows local and state building codes. If you don't feel quite brave enough to undertake the refacing project on your own, then you'll want to hire a mason. With a professional mason in charge of your project, you can rest easy, knowing your newly refaced fireplace will be up to code. A mason knows what will be the best material to use for your particular fireplace and might have a few suggestions you hadn't considered. Be sure to get a few estimates before deciding, then select the one you feel is the best match for your project. Thin veneers are a good refacing material choice because it's a cost-effective great look. It's also easy to install. Another man-made choice is cultured stone because it looks like real stone. Both veneers and cultured stone veneers won't add thickness to your existing fireplace and will be light in weight. If mass and thickness are not concerns, you can use real stone or tiled stone. Just be certain your fireplace is strong enough to support the additional weight or you'll need to build-in a system of support. Brick Tile - This thin brick veneer is usually no more than 5/8" thick. You apply it with mastic and then fill in the joints. You can either install this over the existing facing material or remove the old facing and replace with the new. Your choice of refacing stone may seem limitless and it's easy to get confused. Before you begin shopping, decide on the kind of stone you want to use. Many of the refacing stone systems can be installed just as you would install tile. Updating your fireplace will improve the value of your home. Your fireplace refacing stone project can give you years of enjoyment.